Accessibility for New England is a proud authorized supplier of portable aluminum & rubber ramps for EZ Access. Please view the different threshold types below to find the one that best fits your needs or call us @ the number to the right with any questions. WHY CHOOSE PORTABLE WHEELCHAIR RAMPS? when a permanent ramp is not feasible or available. Most are designed for quick and easy use with scooters and all wheelchairs. EZ-ACCESS is the leading manufacturer of portable wheelchair ramps. The SUITCASE® Advantage Series ramp, with its single fold design, offers a simple solution for wheelchairs and scooters to access vehicles or overcome steps with ease. This ultra-strong portable wheelchair ramp provides the safety and strength required while remaining light and portable. 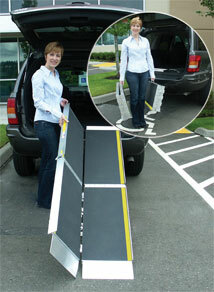 The ramp can be used as one unit or separated, making it even more convenient to use, carry, and store. By simply removing two hinge pins, the SUITCASE Advantage Series ramp quickly separates into two lightweight sections, each with their own carrying handle. Ramp features a self-adjusting bottom transition plate for easy conversion from ramp to ground, and an applied, high-quality skid-resistant surface with yellow safety strips. Unfolds to a 29” wide platform. Manufactured of welded aircraft-grade aluminum. Features an 800 pound weight capacity and 3-year limited warranty. Extend the usefulness of your SUITCASE® Advantage Series ramp with the optional TLE (Top Lip Extension). Made in the USA. The TRIFOLD® Advantage Series ramp, with its unique 3-fold design, offers the length required for wheelchairs and scooters to easily access steps, vehicles, and raised landings. This portable wheelchair ramp is designed to be used and carried as one unit, or if desired, can be quickly separated into two individual sections. By simply removing two hinge pins, the TRIFOLD Advantage Series ramp quickly separates into two lightweight halves, each with their own carrying handle. The durable, patent-pending hinge with interlocking brackets provides smoother operation and reduced pinch points. Ramp features a self-adjusting bottom transition plate for easy conversion from ramp to ground, and an applied, high-quality skid-resistant surface with yellow safety strips. Unfolds to a 29” wide platform. Manufactured of welded aircraft-grade aluminum. Features an 800 pound weight capacity and 3-year limited warranty. Extend the usefulness of your TRIFOLD® Advantage Series ramp with the optional TLE (Top Lip Extension). Made in the USA. Great for home access. Available with or without handrails. When mobility needs extend beyond the scope of a conventional portable wheelchair ramp, the heavy-duty PATHWAY is the answer! Designed for safety and engineered for reliability, this 36” ramp features an 850 pound weight capacity and easily accommodates wider chairs. Also ideal for use with walkers, canes, and crutches. Designed for indoor or outdoor use, this low maintenance ramp will coordinate with nearly any environment and can be easily relocated as your needs change. Made of aluminum and features a durable, extruded, non-skid driving surface. Features an 850-pound weight capacity and 3-year limited warranty. The PATHWAY with HANDRAILS features a clean, modern appearance and is an attractive alternative to costly wooden ramps. Some assembly is required (simply attach the handrails using minimal tools, set ramp in desired position, and it's ready to use). Includes all necessary hardware. Powder coated handrails are welded for extra strength and durability. Available in gray only. Made in the USA. The PATHWAY® LITE is a secure solution for temporary or semi-permanent home access. Ramp features a solid, seamless design, making it ideal for use with scooters, wheelchairs, and walkers. This ultra-strong ramp is made of aluminum and provides the safety and strength required while remaining lightweight and portable. No assembly or folding required – simply position the ramp and it's ready to use. Features an applied skid-resistant surface and a self-adjusting bottom transition plate for easy conversion from ramp to ground. Manufactured of welded aircraft-grade aluminum with a 600 pound weight capacity. Three-year limited warranty. Made in the USA.